There is an understandable concern that in our increasingly digital world we are bombarded with spurious and disparate bits of information from any number of electronic devices, and this is suspect of causing a variety of collective cognitive shifts (for example, as I type this blog entry I’m listening to Joe Strummer and my cell phone is sitting to my immediate right ready to receive and announce any number of texts and phone calls). Sometimes this cognitive shift is reflected (or presumed to be reflected) in the seeming inability of young adults to carry on a real-time conversation complete with the niceties intrinsic to social discourse in the twentieth-century. Ever ask a young adult a question, and then have them simply stare at you at length without any kind of response? Perhaps I’m misreading this as well. Perhaps I’m the one that needs to have a serious adjustment? Well, not yet. Hear me out. For example, I remember my late grandma Christy going on at length about what constituted “success” in any vacation. She would say, “I had several days of long visits with [insert name of relative or close friend here]…” Rarely was her vacation success a matter of conquering monumental architecture, or pounding around some metropolis looking for real or superficial authenticity. Sure, she wouldn’t mind doing that. But she was more interested in long conversations with people she cared about. But enough of all that for now (a conversation worth revisiting, indeed; love you grandma Christy). 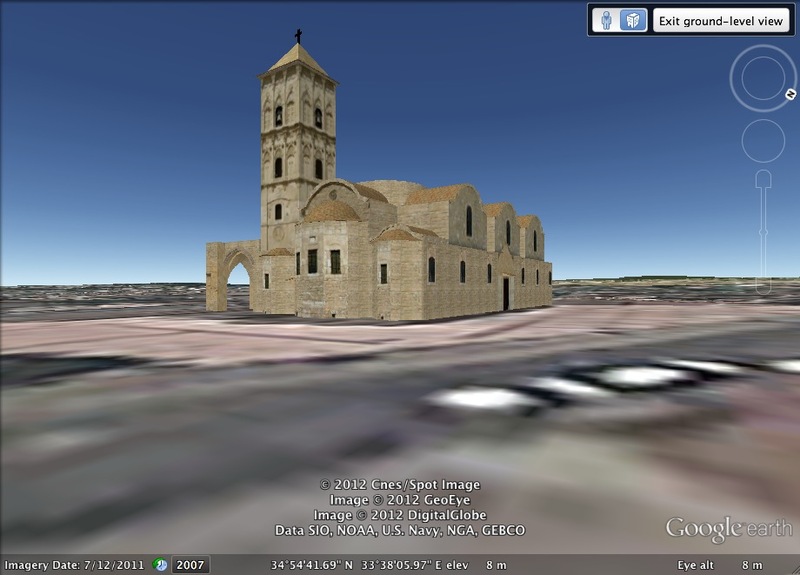 Here are some real and digital images of monumental architecture from Larnaka, Cyprus, at least the St. Lazaros Church as taken in mid-June 2012, and as presented in Google Earth’s 3D image modeling. Google Earth snap shot of St. Lazaros Church in Larnaka, Cyprus. 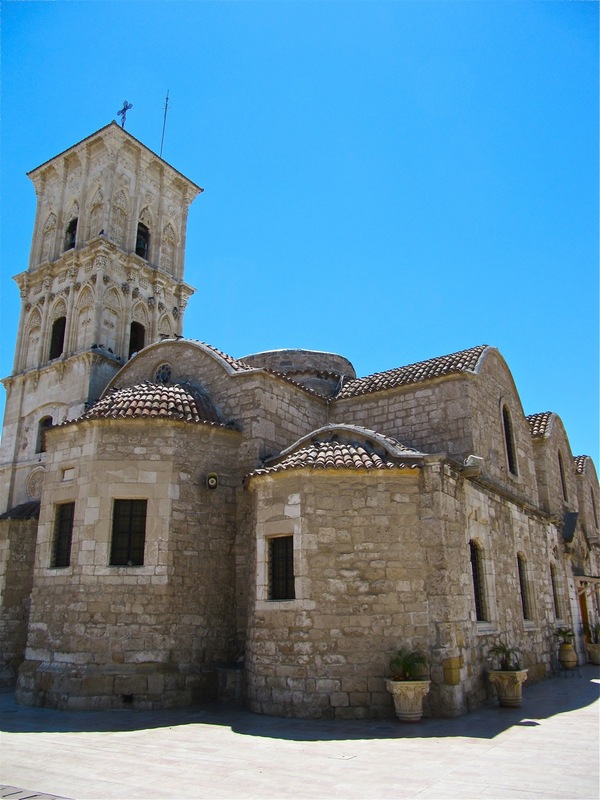 Photograph of St. Lazaros Church in downtown Larnaka, Cyprus, taken on the afternoon of June 10, 2012. Surviving and thriving in our 21st century digital world requires a degree of self-discipline and control, but you could say this discipline was required by any age. For example, when setting out on the Internet on some type of research trajectory, it is all to easy to get lost in hyperlink rabbit holes. We often have a vague recollection of why we opened the browser, but pretty soon we’re lost in the digital ether, one link click after another. We snap out of this link clicking, often wondering whether we just spent 15 minutes or three hours on said link clicking, and all without really knowing what we looked at. It’s much like getting sucked into television for a period of a couple hours and then saying, “What the hell did I just watch?! Where am I?” Yup, we’ll never get that time back. This entry was posted on Wednesday, June 13th, 2012 at 10:30 am	and posted in Uncategorized. You can follow any responses to this entry through the RSS 2.0 feed.